New York, March 7, 2013 – In his first statement since Secretary-General Ban Ki-moon expanded his mandate to become his Special Envoy for Financing the Health Millennium Development Goals, Ray Chambers applauded the critical impact that the new funding model announced by the Global Fund to Fights AIDS, TB, and Malaria will have in achieving the goals by December 2015, the internationally agreed deadline. Last week the Global Fund announced that up to $1.9 billion in additional resources will be made immediately available over the next year that will potentially save millions of lives. Approximately 75 million additional mosquito nets will be purchased as part of the new funding, protecting 150 million people. 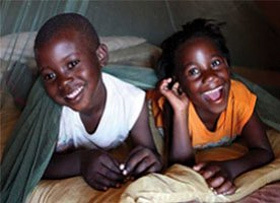 When added to the existing 66 million nets already scheduled for financing and distribution this year, the lives of over one million children will be saved from malaria, placing the Secretary-General’s goal of decreasing malaria deaths to near zero by the end of 2015 in even closer reach. An additional $1 billion will now be made available for HIV/AIDS and another $200 million for TB programming, above and beyond existing funding. This year marks the fourth replenishment of the Global Fund, which is its final fundraising round prior to the 31 December 2015 deadline for achieving the Millennium Development Goals.